Earlier this year I had the opportunity to try out the DoBot Magician robotic arm. 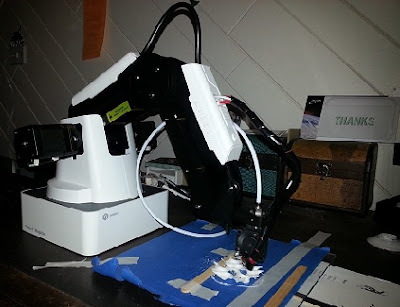 First I want to mention that this arm, being worth over 1000 USD, doesn't really fall within this blog's usual purview of robotics on a shoestring budget! I got to try it out on loan from a coworker; he was hoping to use it as part of a project on a tight schedule, and wanted my help to get it running properly. He was primarily interested in its 3D-printing capabilities, so that's what I'll be focusing on in the review that follows. From a hardware quality perspective, the Magician seemed very nice: solidly built, precise, and attractive. When I first heard about the notion of using an arm to 3D print, I had some doubts … but DoBot's hardware seems to have the resolution needed to turn out decent prints. It comes with a cooling fan for the cold end of the print head, though it does not have fans to direct air down to the previous layers of your print. The only potential issue that I noticed with this arm's mechanical nature was that the plastic housing around the base of the arm seemed misaligned, such that it was rubbing against the moving parts on one side; this left a visible streak of abraded plastic after the arm had been running for a while. The Magician during my first try at printing with it. The DoBot Magician is intended to be multi-use, so a little bit of assembly was required to mount the 3D printing accessories on the arm. This proved fairly straightforward – apart from my own nervousness at even handling a $1000+ piece of equipment that didn't belong to me. Getting the software set up and linking DoBot to my Windows 7 desktop was mostly straightforward as well. There was a time or two when I plugged in the USB cable and it would not connect to the computer for no apparent reason … only to start working again later, after being plugged and unplugged multiple times. I did not run into any particularly nasty driver issues, however. The Magician comes with custom controller software provided by the manufacturer, but switches over to Repetier Host when you want to do 3D printing. A copy of Repetier is bundled with the DoBot software. The first time I requested 3D printing and auto-swapped to Repetier, it asked me if I would like to upgrade to the latest version, as opposed to the one that came with the Magician … and I almost did. However, I ended up deciding not to meddle before I tried for my first print. I did make sure the firmware on the arm was upgraded to the manufacturer's latest version. One or both of these things might have helped me avoid seeing the problem my co-worker experienced when he tried to print for the first time: namely, the arm's coordinate system seemed to be totally messed up, such that any movement upward was also accompanied by such a dramatic XY movement that it soon walked right off the print bed. I followed the documentation carefully when it came to choosing my starting settings and homing the arm, and my first prints weren't nearly so catastrophic. I struggled through some classic 3D printing hitches, like trouble getting the first layer of the print to adhere to the bed properly. I won't dwell on these, because I suppose they would be common to most any model of 3D printer. However, there were a couple of issues that raised questions about the DoBot specifically. The first obnoxious problem was that the Magician's print head would travel in the Z direction as it moved in the X and Y directions – not a lot, perhaps only a few millimeters, but certainly enough to ruin a 3D print. In essence, it was trying to lay down filament in a plane tilted a few degrees off horizontal. I was forced to compensate for this by carefully putting shims underneath either the print bed or the base of the arm, to get that plane back into proper alignment with the print bed. Homing the printer at any point after I did this would tilt the printing plane even further and require me to make a whole new set of adjustments, which tells me that this wasn't a simple mechanical offset; the Magician was using sensor feedback to actively fight my efforts. This made setting up for a print a very fiddly process, and of course I couldn't compensate for the angle perfectly … meaning that all my printed objects had a small but noticeable amount of XZ and YZ skew. For prints intended to be used as engineering parts, this could well be unacceptable. I looked in vain for some way to calibrate the Magician that would work out better than shoving Popsicle sticks under it, and came up empty-handed. There doesn't seem to be a way to input measurements from your print results and have it compensate. The dimensions of the test “cube” I printed were also a millimeter or two off. Several objects that I printed with the DoBot Magician. Skew is most noticeable on the unfinished test cube in the center, but they all have some degree of it. The other problem was an apparent bug that only happened once. 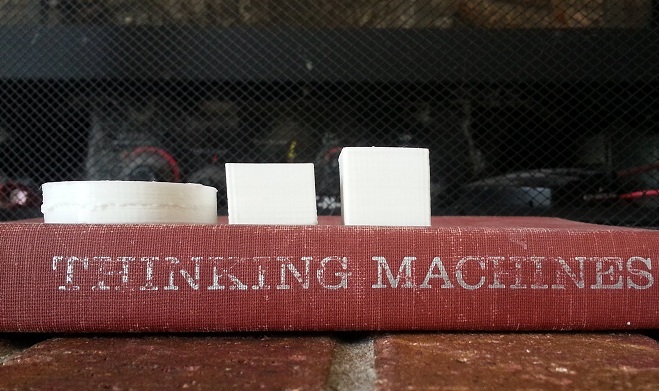 Two-thirds or so of the way through printing a test cube, the Magician stopped moving. The extruder retracted the entire filament, then switched directions and started continuously forcing plastic out, creating a giant melted blob at the location of the now-stationary print head. I had to forcibly terminate the print job, which could not then be resumed where it left off. I re-printed the exact same test cube later (after re-slicing it), and the job ran to completion without reproducing this issue. I don't know whether the root cause of the problem would be in Repetier, in the slicing software, in Magician's firmware, or in some combination of them rubbing each other the wrong way. As I tried to troubleshoot these and other problems, I ran into a difficulty which isn't really the Magician's fault, but is pertinent nonetheless: there doesn't seem to be a critical mass of people using it. I uncovered a few product reviews, but very little content that featured other users actually struggling through problems with the arm and publishing advice. For English speakers, the Magician comes with somewhat poorly-translated documentation, and dealing with DoBot tech support involves communicating through a language barrier as well. They did respond to most of my co-worker's queries in a fairly timely fashion, but started ignoring us when we requested the code for the firmware, even though the Kickstarter campaign that produced the Magician claimed it would be open-source. Aside from wanting to correct the faulty calibration/XZ skew issue, my coworker was eventually hoping to modify the arm to extend its reach, meaning we would have to get into the firmware code and edit the inverse kinematic calculations. He ended up deciding to pull the Magician's guts out, replacing them with the third-party electronics needed to run some open-source third-party firmware. In the process of doing this, we discovered a final annoyance: DoBot doesn't seem designed to be disassembled by the user for modification or maintenance. The base plate is tightly retained by the rest of the case, so after you remove the fasteners, you have to literally pry it out with a knife – hopefully not damaging the electronics inside in the process. The mechanics inside the base are supposedly not even accessible. The arm has been returned to its owner, and I'm not sure if he's tried to print with the new electronics and firmware, but perhaps I'll add an update here if I ever hear how it goes. My conclusion is that the DoBot Magician had a lot of potential, but didn't really deliver as a user-friendly 3D printing solution. I definitely wouldn't recommend it to someone who wants an easy, works-out-of-the-box sort of experience. And when I get around to buying my own 3D printer, I'll make a point of choosing something with a robust user community that I can lean on for support.